« We will be your people. We will be your church today! From ELM: We did it! Proclaim (ELM’s professional community of publicly identified LGBTQIA+ ministers and candidates) just hit 300! Join us in a bold welcome to Sergio Rodriguez, Proclaim’s 300th member. I must from the outset thank and praise our Triune God for the grace which brought us all here together for ministry in our world today. This message of the grace of God in Christ Jesus continues to shape and mold our communities from which God calls us and will call others like us to ministry. Growing up the gay son of two Mexican immigrants, the notion that God would call anyone outside the sexual and gender norms of our Mexican-American society seemed contrary to God’s will. Though I loved Jesus, his mother Mary, and the church, I found myself at odds with the wider Roman Catholic institution because of my sexuality. While this effectively made me leave the church during my high school years, I found myself returning to the Roman Catholic church as I studied at Baylor University. At Baylor University, I felt God called me to serve the capacity as a minister of the church and to test this out. I became the chaplain of two music organizations; the Baylor University Marching Band and Kappa Kappa Psi. Despite serving in this capacity, I still resented my sexuality and found myself hungering for a God who would simply accept me for who I was and who I wanted to be. During my senior year of college, God showed me the message of radical and inclusive grace for all through my studies of Dr. Luther’s works, conversation, and conversion to Lutheranism. At that time, I felt that I needed to wait before I dived right into word and sacrament ministry. From the end of college up to this present day, I managed to complete a Master’s of the Arts in Theology from Concordia Theological Seminary, switch from the LC-MS to the ELCA, and move to San Antonio where I briefly studied Marriage and Family Therapy. About two years ago, the weight of these changes finally took their spiritual toll on me as I contemplated giving up the idea of being a rostered word and sacrament leader in the ELCA. I felt that I was unable to find an affirming congregation that would also attend to my identity as a Latinx Lutheran. Precisely at that moment, God made me aware of Gethsemane Lutheran Church and Jesus Maestro church in San Antonio where I met my future pastoral supervisor and Spiritual Father who awakened in me that call I felt so many years ago in college. 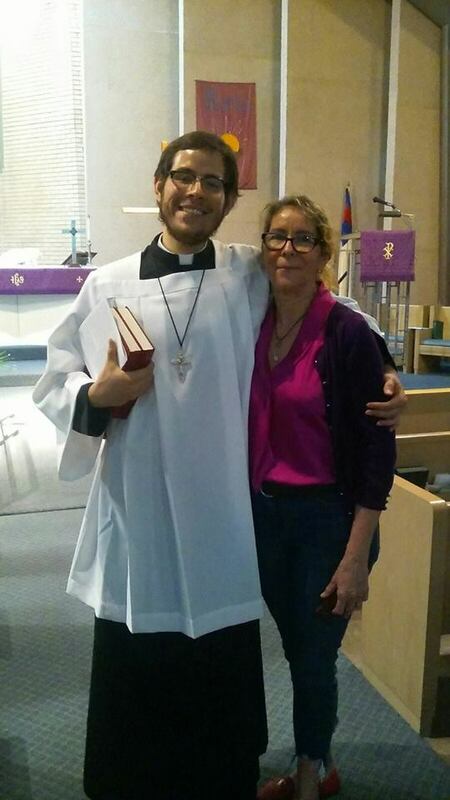 Moreso, he reaffirmed my dignity as a gay Mexican Lutheran and made me aware that God calls people to ministry regardless of where they are in their lives, their gender, their sexuality, and their race. So when a classmate of mine encouraged me to join Proclaim, I knew without a shadow of a doubt that it was God gathering me to a community of fellow believers and leaders to join them in proclaiming the Gospel of our Crucified and Risen Lord that all may know the all-inclusive love of God! Bio: Sergio Rodriguez (he/him/his) Growing up in the Texas borderlands in an immigrant household, my parents raised me to be aware of how the border defined our identities, culture, and lives as children of God. While my formative years were spent growing up in socially conservative Mexican household in McAllen, TX, I found affirmation, mercy, and unconditional love amongst my fellow musicians, religion majors, and friends at Baylor University. Though I continued to struggle to integrate my Latinx identity with my faith, I felt God calling me in the midst of an emotionally difficult time of my life during my senior year of college to a position of leadership knowing full well the lucha that people of color face in the church. Unbeknownst to me as I navigated through the institution of the Lutheran Church- Missouri Synod, God needed me to mature, develop, grow and learn further about what radical grace means for all people today. After taking a year off following graduation and moving to San Antonio, God kindled in me the passion, the confidence and knowledge for being a leader in the church for the sake of the world and moved me to start the candidacy process for rostered word and sacrament ministry. As I progress through my studies at Wartburg Theological seminary and candidacy process, God has continued to assure me there is no more certain calling for me than to proclaim Christ crucified for the sake of the world in word, sacrament, and deed. This entry was posted on Thursday, September 20th, 2018 at 1:12 pm	and is filed under Blog, Uncategorized. You can follow any responses to this entry through the RSS 2.0 feed. Both comments and pings are currently closed.